The bérets bayadère are inspired by the interbellum's Roaring Twenties, or "Années Folles" ("crazy years"); Parisian jazz clubs and a hunger in people to express themselves and shed off the old conformative shells of society. The term bayadère has two meanings: "dancer", from the Portuguese "bailadeira", and "fabric in striped, bright colours". The berets bayadère come in a variety of these multi-coloured linings, similar to those berets of the era that are now showcased in museums. Beautiful berets in both appearance, touch and comfort! 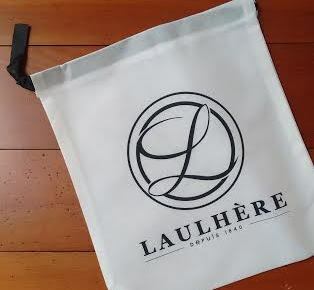 Special edition Béret Bayadère in 10p (280mm) with Isturitz lining and presented in a white Laulhere bag. 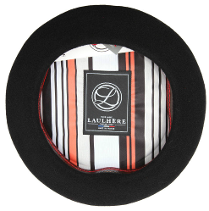 Laulhère's top quality beret in it's very best finishing.